Sounds like the beginning of a bad joke: three feminists walk into a theatre to see The Taming of the Shrew. From a woman’s point of view, this Shakespeare classic can be stomach-churning. However, taking a look at cast and director, we trusted the material to be in good hands. Thankfully, we were right. After last year’s A Midsummer Night’s Dream, it was difficult to write about it without giving away too much to those who still might see it. Once again, I find myself in the same position with a play directed by Chris Abraham and a lot earlier in the season to boot. I wouldn’t want to spoil the experience for anyone, so this is going to be short for a change. The costumes range from beautiful to intentionally ridiculous, the latter also being valid for certain props. There are not a lot of set changes necessary, so the production runs smoothly without interruptions when the story switches between locations. 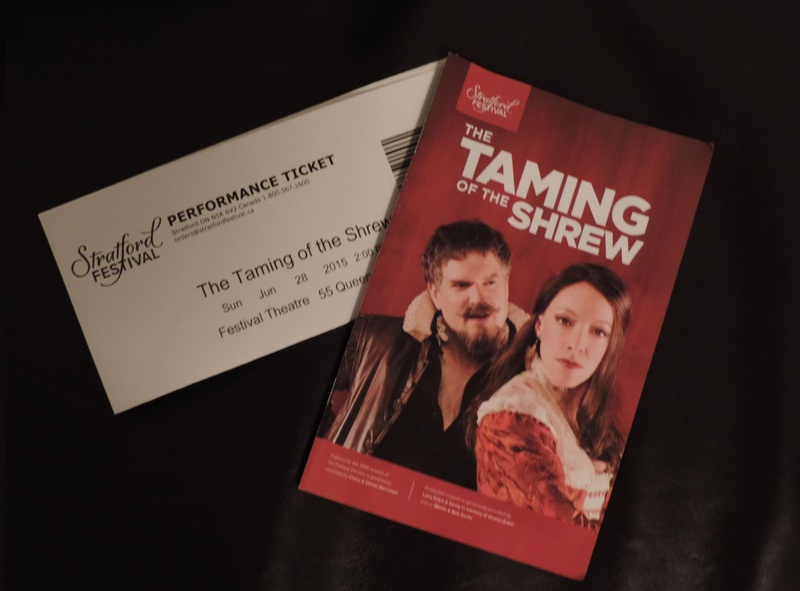 The play is of course brutal in some parts and the men’s ‘wife-off‘ at the end is appalling even though Ben Carlson’s Petruchio seems to come to his senses at the end, but if you enjoy and appreciate the language it’s still funny and unfortunately also still relevant. The acting is brilliant throughout; real life couple Deborah Hay and Ben Carlson as quarrelling Kate and Petruchio wrestle not just verbally but also physically, Tom Rooney finally gets to wear pumpkin pants and is once again hilarious, Peter Hutt seems to get better every year, Mike Shara is rocking the lute and I could go on like this for the rest of the cast. Actually, Michael Spencer-Davis’ Gremio reminded me a bit of one of the farmhands in the infamous Austrian musical ‘Der Watzmann’. That’s about all I’m giving away about this production, so just do yourself a favour and go see it. It’s hard to believe we’ve already seen five productions in the last days, one of which twice, and only have two to go Tuesday and Wednesday. Time really flies when you’re having fun. This entry was posted in Live, Reviews, Stratford Festival (Canada) and tagged Andrew Robinson, Ben Carlson, Brad Rudy, Brian Tree, Chris Abraham, Cyrus Lane, Deborah Hay, Derek Moran, Festival Theatre, Gordon S. Miller, John Kirkpatrick, Josue Laboucane, Michael Spencer-Davis, Mike Shara, Peter Hutt, Robert King, Sanjay Talwar, Sarah Afful, Sarah Orenstein, Stratford, Stratford Festival, The Taming of the Shrew, Thomas Oladjide, Tom Rooney, Xuan Fraser. Bookmark the permalink.